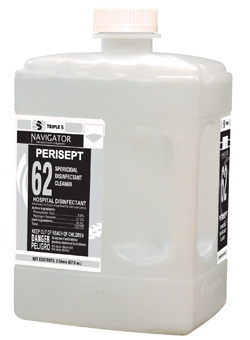 SSS Navigator #62 Perisept Sporicidal Disinfectant Cleaner is now available through all Triple S dealers*. This new EPA registered sporicidal disinfectant cleans and kills a broad spectrum of bacteria and organisms, including Clostridium difficile in just 2 minutes, one of the most difficult spores to kill and control in a healthcare setting. The 2-minute claim is the fastest kill claim against C.diff in the industry. SSS Navigator #62 Perisept has over 50 specific bacteria/virucidal claims including claims against the more prevalent - MRSA, CA-MRSA, E.Coli, Norovirus, Influenza A, and Hepatitis B/C. The New Smell of Clean! Sporicidal disinfectant cleaners require a higher concentration of active ingredients and have been challenged by the fragrance. At a recent conference, many attendees commented on the quick dissipation of the vinegar-like odor. With the higher dilution rate, the fragrance is much less of an issue. SSS Navigator #62 Perisept is designed for use with the closed loop Navigator Dilution Control System. The Navigator DCS offers closed loop dispensing and minimizes contact with the concentrate. The easy to follow numbering and color-coded labeling simplifies training for EVS departments. The high 1:32 dilution rate offers customers a lower end-use cost making it affordable for use as a daily cleaner, in addition to operating rooms, isolation rooms and post discharge. Standardizing to one disinfectant cleaner reduces training challenges, potential confusion, as well as, the number of chemicals stored in the supply closet. The Navigator Dilution Control System is available in 4-station, single station and portable dispensing units. The non-bleach, hydrogen peroxide/peroxyacetic acid based formulation leaves no harmful or corrosive residues, no undesirable film on surfaces. SSS Navigator #62 Perisept is compatible with many different surfaces and medical equipment used in healthcare including stainless steel, aluminum, chrome, glazed ceramic tile, plastic and painted surfaces, and finished floors. Unlike bleach-based products, it will not corrode metal or damage mattress covers, and requires no rinsing. See the Technical Guide for a broad list of compatible surfaces.